How Many Counter-Offers Should You Make on Your Personal Injury Claim? You are here: Home / Have You Been Injured in a Car Accident? 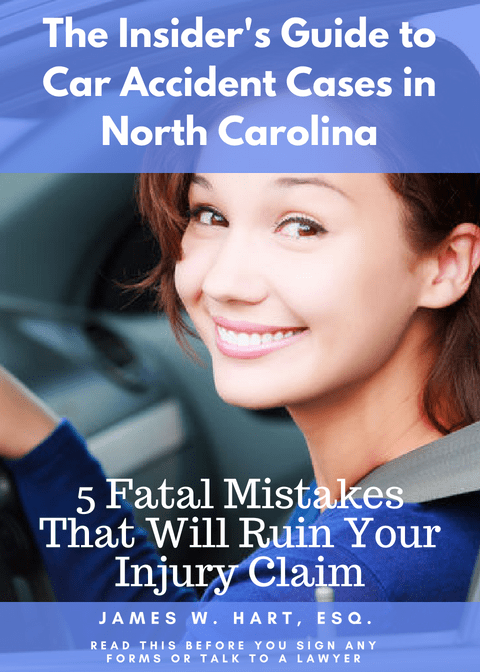 / The Ultimate North Carolina Auto Accident and Personal Injury Claim Guide / How Many Counter-Offers Should You Make on Your Personal Injury Claim? I’ve been involved in a lot of negotiations during the course of my legal career, and the only thing I can tell you for certain is that they are all different. They are different because of the client I am working with and they are different because of the lawyer or litigant that is negotiating against us. They are also different because the facts of each specific case are drastically different. But one thing remains the same – the method in which we, as a law firm, approach every negotiation. The first step is to figure out what the best and worst case scenario would be for you if you were to go to court. We will prepare a detailed settlement analysis for each client after they have either finished their medical treatment or have reached what is called MMI, or “maximum medical improvement”. This is a roadmap that we will use for the settlement negotiations. Step two is to figure out what the insurance adjuster wants. Typically, this is pretty easy. They want you to accept as little as possible for the claim as quickly as possible. Step three is to try and negotiate until we know with a fair amount of certainty what the highest is that the adjuster would be willing to pay for your claim without forcing them into court. Once you know what the highest amount is that the adjuster is willing to pay on the claim, then you can make an informed decision about whether or not you want to want to accept their offer or file a lawsuit. So the question remains – how many counter-offers do you need to make to get to this point? In all honesty, it depends on your case and the adjuster that has been assigned to your file. In some cases, you will make one counter-offer and get a settlement offer that you are happy with, and in other cases it may take weeks or even months of back and forth negotiations. I’ve seen both scenarios. Is the Insurance Companies Offer Reasonable? Are You Confidant that You have Received a Final Offer? When you are evaluating the merits of your case, you must consider all possible factors. After you send your initial counter-offer to the adjuster, it may take them several weeks or longer to get back to you. You should be patient during this time and understand that this is a normal part of the process. The insurance adjuster will have to recalculate the amount of money they are willing to pay, and in some cases they may need approval from a manager who is on vacation. Don’t jeopardize your claim by calling the adjuster every day for an update. Once you do get a response, you must decide whether to accept, reject, or counter their revised offer. To do this you must have a firm grip on whether their offer is reasonable or not. How do you know this? You must review the offer and determine whether it includes things like: reimbursement for your medical expenses, lost income (past and future), damage to your vehicle, payment for pain and suffering, and future medical expenses. Also, you should compare their offer to your pre-planned settlement range, i.e. the amount of money that you were willing to accept to settle the case before you started negotiating. If you are unsure how to evaluate the insurance companies offer, then you should call a personal injury or auto accident lawyer for assistance in evaluating your case. One technique that we have found helpful in negotiating a claim is to try to appeal emotionally to the adjuster. The best part of this technique is that even if it doesn’t help you settle the case, you can use the preparation you do here to assist in appealing to a jury, who is more likely to be persuaded by emotion. How do you do this? Simple. You tell the adjuster how the accident has impacted your life on an emotional level. We ask our clients to complete a “day in the life” exercise that discusses what your typical day is like after the accident. What can’t you do now that you could do before and how does that make you feel? Will this technique work for all adjusters? No. But it might work for some, and you can never tell how much additional money an adjuster will place on your claim unless you try this strategy. If you are negotiating directly with your insurance company because the at fault party didn’t have insurance coverage, you should be aware of the amount of coverage you have on your policy. The tricky part is when you are negotiating with the at-fault parties’ insurance company. In North Carolina, there is a statutory procedure you must follow to obtain the limits of the defendant’s insurance policy – that is, the absolute worst case scenario for the insurance company. Before we get into the procedure you must follow to obtain the policy limits from the other insurance company, you should be aware that the statutory minimum for every North Carolina driver is $30,000 in bodily injury coverage per person and $60,000 of bodily injury coverage per accident, in addition to another $25,000 for property damage. What this means is that if you were hit and injured by someone with minimum insurance and your damages were $75,000 (not including your property damage), then the most you can recover from the other insurance company is $30,000 plus up to $25,000 for the damage to your vehicle. In this case, you would need to make a claim for the remaining damages under the UM/UIM coverage of your own insurance policy. But how do you know how much coverage the defendant has? You can do one of two things – first you need to decide whether you need to know this information to settle your claim. And second, if you do need this information, then you would make an appropriate request that follow’s North Carolina’s legal procedures. (Alternatively, you can file a lawsuit and seek this information in discovery, thereby bypassing these procedures. But that is another issue for another day). Under N.C.G.S. § 58-3-33, the insurance company for the at-fault party is required to disclose to you their policy limits provided you follow some legal hoops. First, you must send a written request for this information via certified mail. Second, you must provide written consent for your health care providers to release your medical records for the three years prior to the date of the accident, in addition to all records relating to the accident itself. Third, you must submit consent to participate in mediation, and finally, you must provide a copy of the accident report as well as a brief description of what happened to give rise to the claim. If you are thinking to yourself, “that seems like a lot of information to divulge”, you are correct. And the decision about whether or not to seek this information under these procedures should only be done with the help of a lawyer. As lawyers, we want as much information as we can about a case before we will start negotiating. Knowing the policy limits can impact the initial offer we might send to the insurance company. But the question remains – is getting this information worth the cost of seeking it? The only way to know for sure whether an offer is “final” or not is to ask the insurance adjuster. But this isn’t the only way. If you see that an insurance adjuster is making small increases in their settlement offer, you may rightfully conclude that they are reaching their final offer. If the insurance adjuster tells you that they are reaching the limits of their authority, you can assume that their final offer may be near. Once you get to this point, you need to start thinking about whether or not you want to settle your case or hire a lawyer to file a lawsuit on your behalf. Were you contributorily negligent for the accident? The possibility that a jury may award you less than the current offer on the table. The time period involved in litigating a case. The cost of going to court, including the cost of hiring experts, court costs and attorneys fees. The uncertainty of leaving this decision to a jury to decide. Gong to court is never an easy decision, and not one you should take on lightly. Nobody likes going to court, but sometimes it is unavoidable. In North Carolina the statute of limitations for most personal injury and auto accident cases is three years. That means that you must file a lawsuit before the third anniversary of the date of your accident. Why is this important? Because if your medical treatment takes a year to 18 months to finish, and then it takes you another 3-4 months to put out a demand, then you are already almost 2 years into your case with no settlement in sight. At this point, the insurance company may start to take a little more time in their counter-offers. If you wait too long to reach a resolution, you may be left without legal recourse.